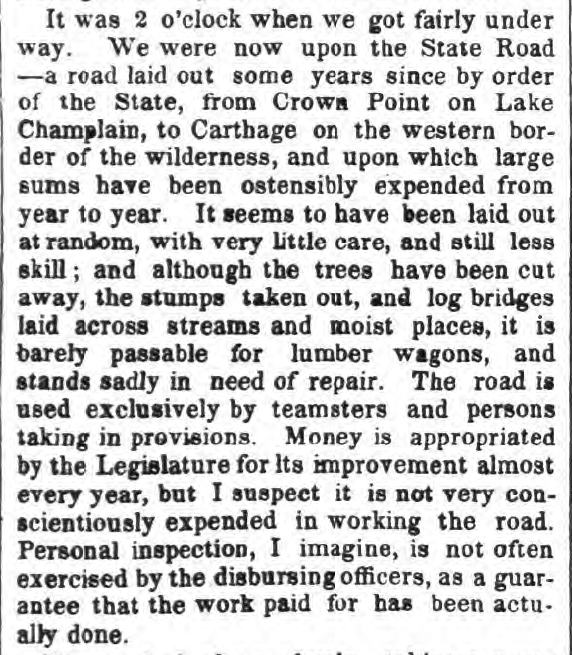 Between 1872 and 1900, perhaps no man traversed the Adirondacks more than Verplanck Colvin. 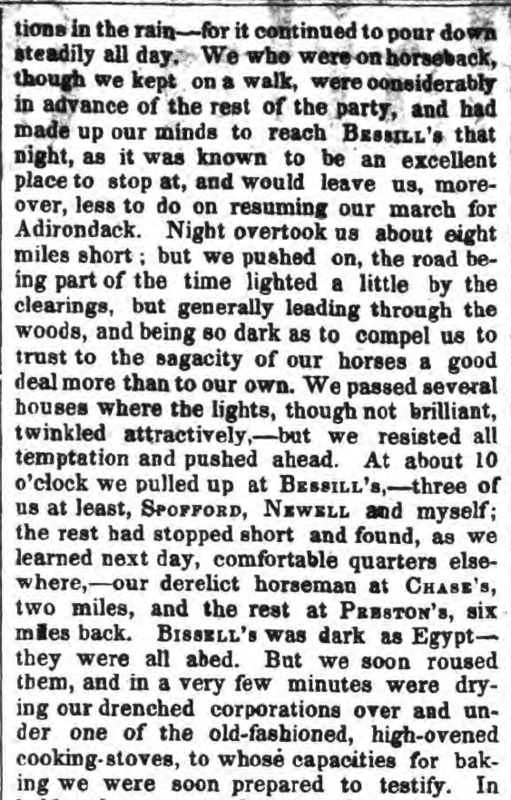 Russell Carson said, “With limitless enthusiasm and boundless devotion, he was exploring, surveying, mapping, and sketching the mountains, valleys, lakes and streams of the region, and writing voluminous reports and papers about them.” 2 Through his sheer personal will, he succeeded in lobbying the state legislature to appropriate funds for the Adirondack Survey and appoint him to the task. His explorations led to the discovery of Lake Tear of the Clouds as the source of the Hudson River and the first accurate elevations for Mt. Marcy and dozens of other regional peaks. While Colvin’s impact on the creation of the Adirondack Park is his most lasting achievement, his development of new survey techniques and technology should not be overlooked. It his efforts to unravel the mystery of the forest through detailed mapping that I find fascinating. Triangulation is the process of determining the location of a point by measuring angles to it from known points at either end of a fixed baseline, rather than measuring distances to the point directly. Colvin used this method to map the Adirondacks using a series of mountain top signal stations. Colvin was not one to avoid harsh and arduous effort in his attempts to map the Adirondacks. Notably, he did not retire to his Albany office in the dead of winter but rather used the frozen lakes to his advantage. 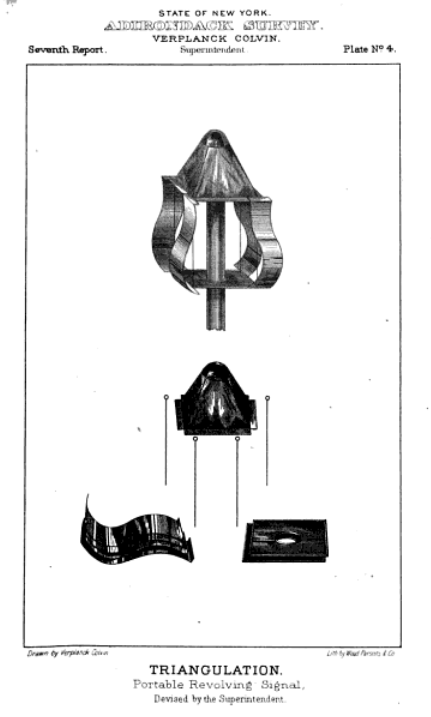 Observations from the end point of such baselines to the mountain top signal stations required Colvin to devise two tools that advanced the accuracy of his methods. The Stan Helio is a spinning pyramid of shiny tin plates that reflect sunlight, providing a bright flash that could be seen in the daytime from twenty-five to thirty miles away with the naked eye and even farther through a telescope. Being able to see the mountain top signal stations from wherever his surveying teams were working was one piece of the puzzle. The other is for the surveying teams to accurately know exactly where they were when they observed the nearest signal station. Determining a location’s longitude and latitude whether by the arc of the sun in day or by stars at night requires that one know the precise time of observation. The accuracy of Colvin’s surveying depended on all of his field teams synchronizing their timepieces to Albany’s Dudley Observatory time. I was intrigued to know why Colvin would have used Thacher Island, when a point along the shoreline would have served just as well and eliminated the effort of rowing boxes of equipment out to the island. 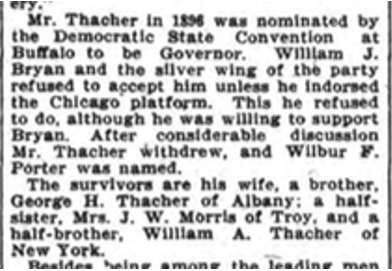 I knew that Colvin was from Albany, but did he know the Thacher family? My early hopes of a connection seemed dashed by viewing Colvin’s Reconnaissance Map of Tallow or Blue Mountain Lake, which incorrectly spelled our name as Thatcher. A family friend would never commit such an error. I delved deeper into the accuracy of the map and found that the spelling was an inaccurate correction made by the printer. In Colvin’s own handwritten field notebooks, he repeatedly spells the name correctly. Triangulation uses math to discover what cannot be readily seen and measured by comparing different points in relation to a baseline. I wondered whether an analogous method of drawing connections between points in time in the lives of Verplanck Colvin and the Thachers might answer my question. 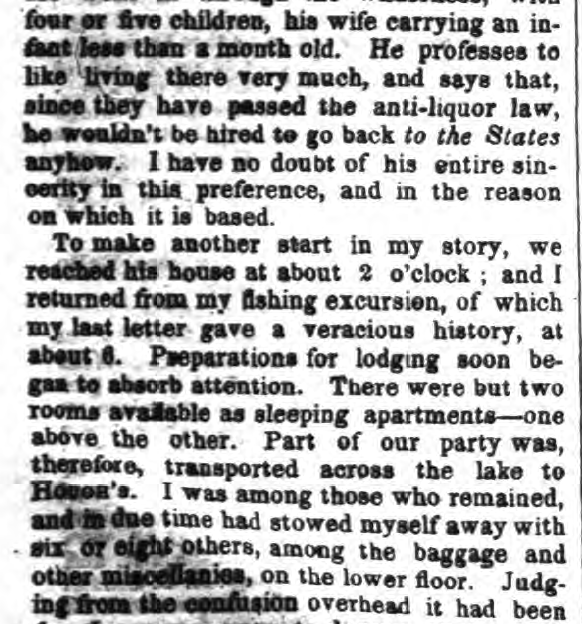 The Thachers began to explore the Adirondacks in 1862 and established their summer home on Blue Mountain Lake in 1867. 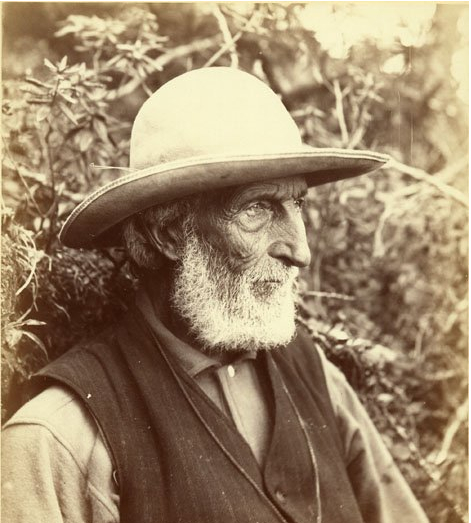 Verplanck Colvin began his explorations of the region in 1865. We have no correspondence or other evidence that John Boyd Thacher and Colvin were more than acquaintances in their youth. 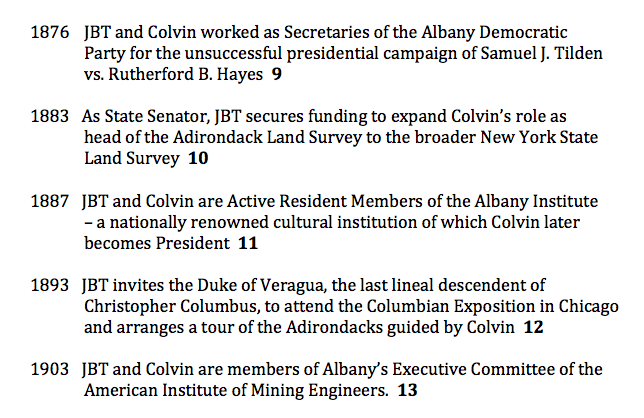 Colvin does not make reference to the Thachers in describing his earliest camping trips to the region, and yet it is hard to believe he did not consult with the first family from Albany to establish a base in the region. I found that JBT’s and Colvin’s lives repeatedly intersected throughout the years. All of these intersecting points prove that the two men knew each other, but were they friends? Only after JBT’s death do I find evidence that it would appear so. to gather the fossil corals and shells… to visit and explore known caves… among the cliff ledges, the “Indian Ladder” region of the Helderbergs offers superior inducements. 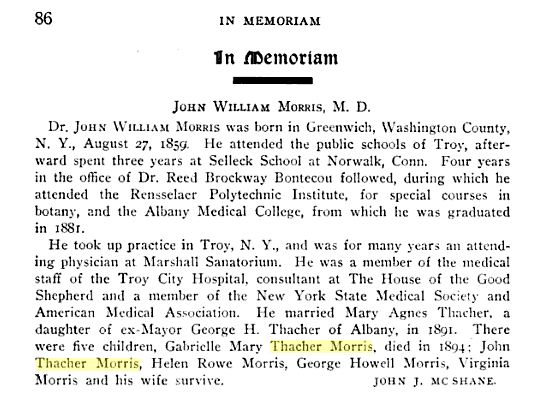 His respected place of inclusion in Mrs. Thacher’s plans for the dedication is, I believe, proof of a lifelong friendship with John Boyd Thacher and furthermore, evidence that Verplanck Colvin deserves credit as the father of two glorious state parks. 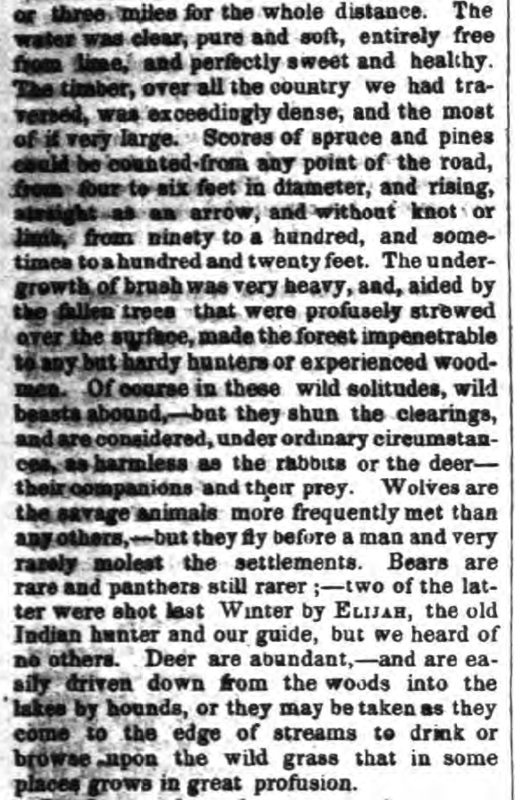 Reverend William H. H. Murray in Adventures in the Wilderness 1869. 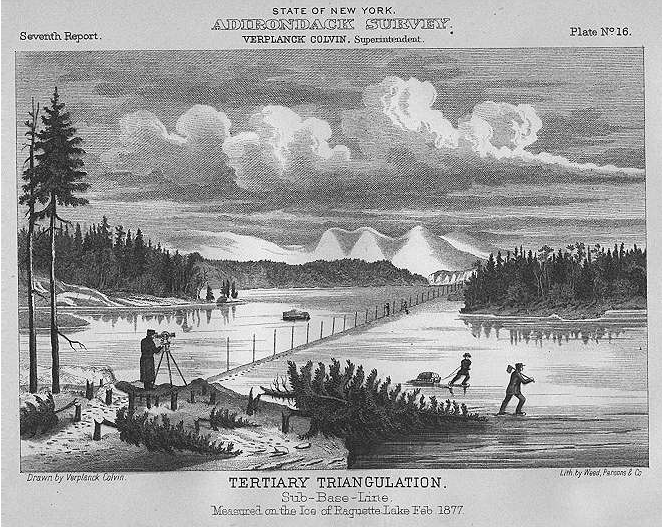 Murray is widely credited with bringing the masses to the Adirondacks. The historian Warder Cadbury said, “Murray quite literally popularized both wilderness and the Adirondacks.” “Murray’s Rush”, the onslaught of tourists who rushed to the mountains in response to his book, gave rise to the claim that the Adirondacks are the birthplace of the American vacation. John Plumley* is the man who brought the Adirondacks to Murray, serving as his guide through his adventures. Following the similar Adirondack migration of fellow Vermonters Matthew Beach and William Wood, Plumley’s father moved his family from Shrewsbury, Vermont, to Long Lake in the 1830s. John was younger than ten when he arrived and quickly befriended an older boy, Mitchell Sabattis. Like Sabattis, John became an active guide at the age of twenty-one. Plumley was the first guide to introduce Beach’s Lake to Dr. Benjamin Brandreth. In 1851, Brandreth purchased 24,000 acres surrounding Beach’s Lake (now called Brandreth Lake) to form the first private preserve in the region. Plumley served several years as caretaker for Brandreth Park and constructed many of the cabins within the park. 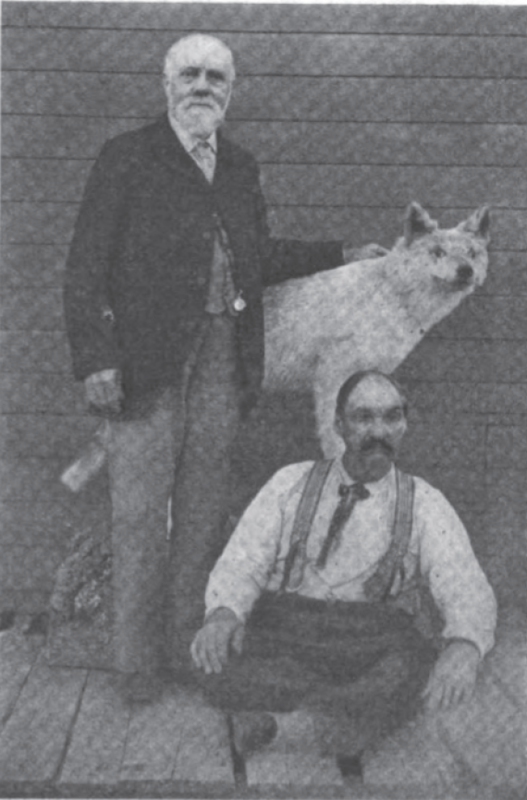 The last photo taken of Plumley in 1899 shows him seated at the feet of what was believed to be the last wolf killed in the Adirondacks. There are two strings that tie Plumley to the fifty acres of Beach and Wood. 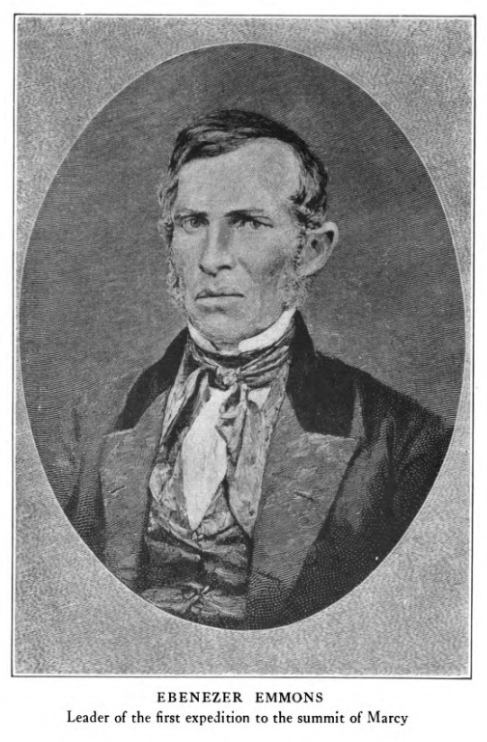 As a young man, Plumley married Zobeda Hough, the daughter of Amos Hough. In 1856, Matthew Beach deeded his 25 acres on Indian Point to Amos Hough on condition that Hough would care for Beach until his death. Although Hough sold the land the same year to a land speculator named Marshall Shedd, from 1856 to1859, Hough and Beach still lived in his cabin on Indian Point. However in the 1860 census, Beach is found living in the Long Lake home of John Plumley, who had assumed his father-in-law’s obligation. Plumley also purchased William Wood’s 25 acres on Indian Point, owning the land from 1859 to 1864. 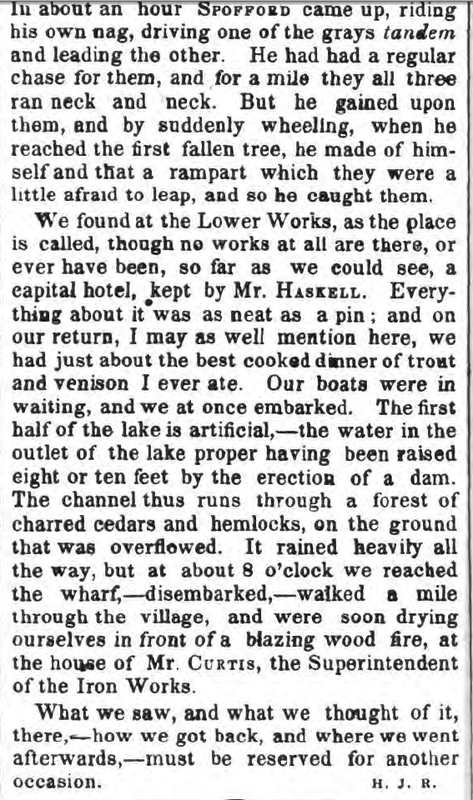 Hough and Plumley’s intimate familiarity with Indian Point led to a most remarkable rendezvous that occurred on these shores in the summer of 1873. 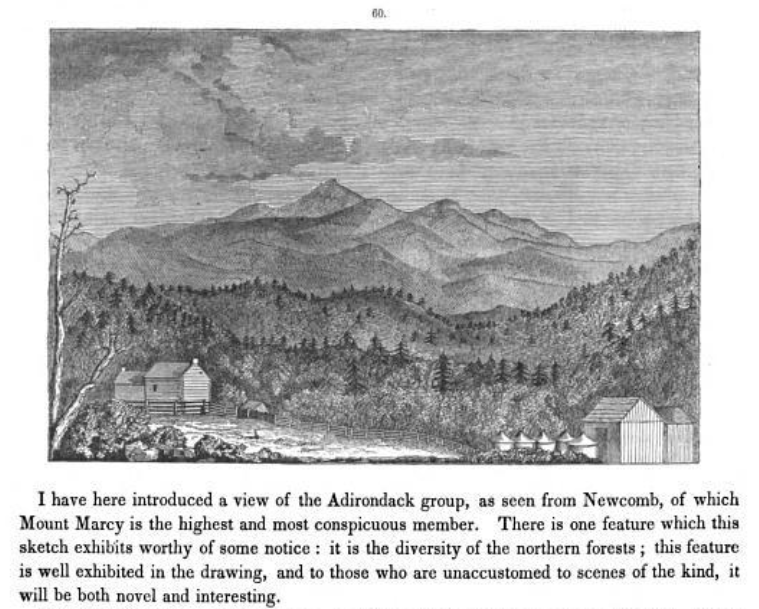 Using Adirondack Murray’s book as a guide, a group of 25 women traversed the Adirondacks from four directions to meet at Indian Point. They were a group of teachers and students from a women’s academy in New York City founded by Amanda Benedict, the wife of Farrand Benedict’s younger brother Joel. 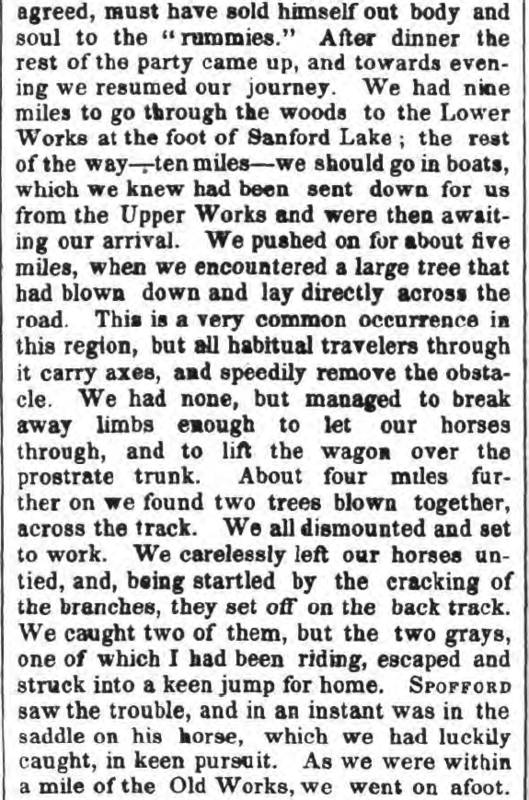 While not the first group of women to explore the Adirondacks, this expedition was clearly the most ambitious. 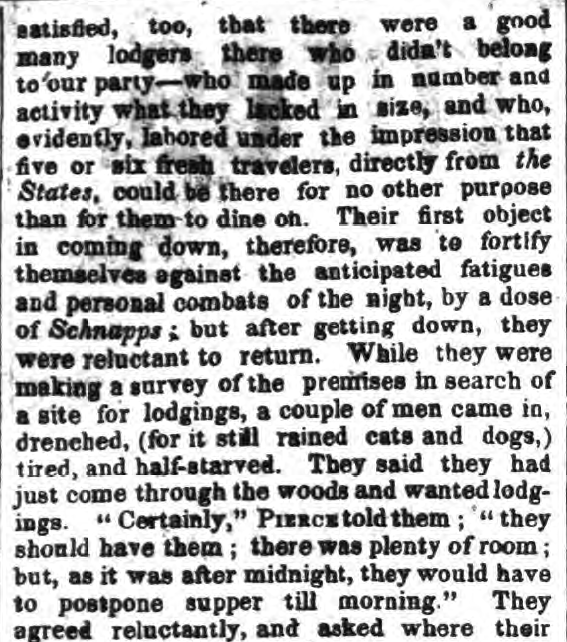 The 16 Adirondack guides employed by the expedition included several of the most prominent guides of Adirondack history: Mitchell Sabattis and his son Charlie, John Cheney, William Higby, James Sturgess, Alvah Dunning, and Plumley. 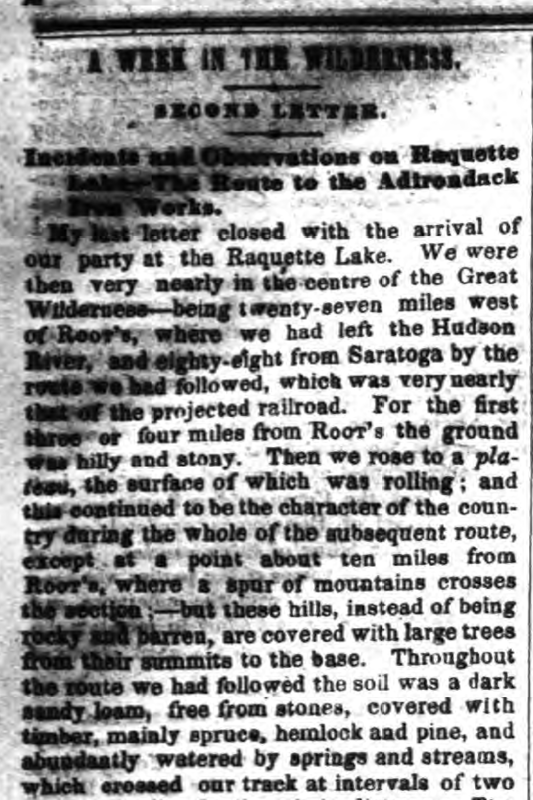 One group travelled from Lake Champlain along the Saranac River and Raquette River to Raquette Lake in the company of Amos Hough. 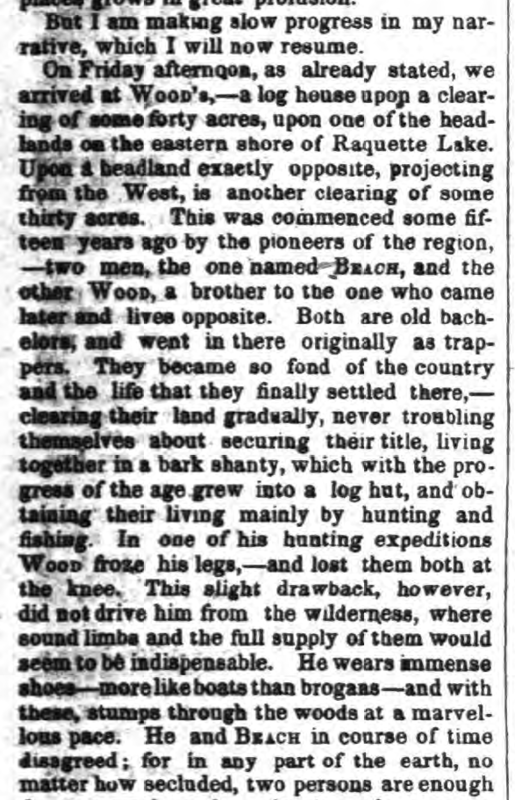 Another entered the region from the west, following the Moose River into the Fulton Chain of Lakes where Plumley guided them through to Raquette. 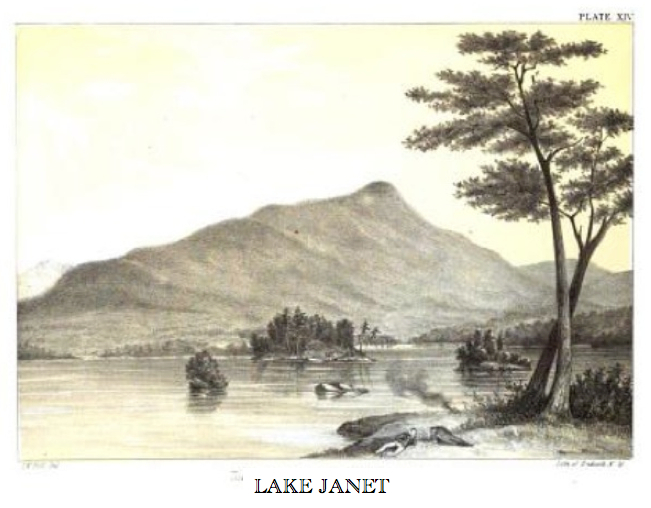 A third group followed a path similar to Sir John Johnson’s escape north from Lake Pleasant, approaching Raquette Lake from the south. The forth group departed Ticonderoga and followed the Schroon River, and then hiked west to meet the rest. 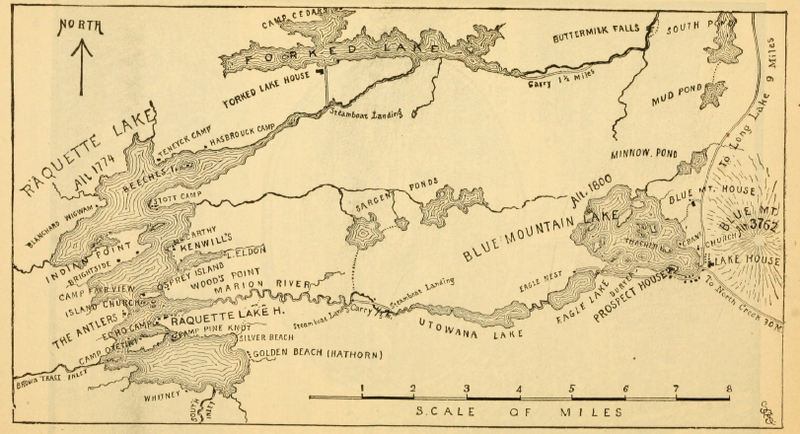 The expedition’s final destination was Blue Mountain Lake, or as the women called it the “Lake of the Skies” (also the title of Barbara McMartin’s wonderful book detailing the expedition). 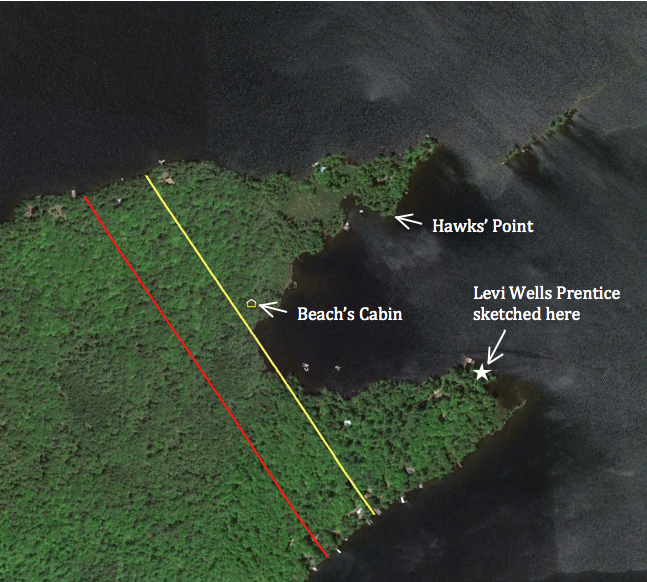 All four groups rendezvoused at Raquette Lake’s South Inlet Falls on June 11th, then spent four days camped near the site of Beach’s cabin on Indian Point prior to continuing to Blue Mountain Lake on June 15th. A number of places could have served for their base camp, perhaps Big Island or Woods Point, which both lie between South Inlet and the mouth of the Marion River that leads to Blue Mountain Lake. Indian Point was out of their way and double the distance from South Inlet. 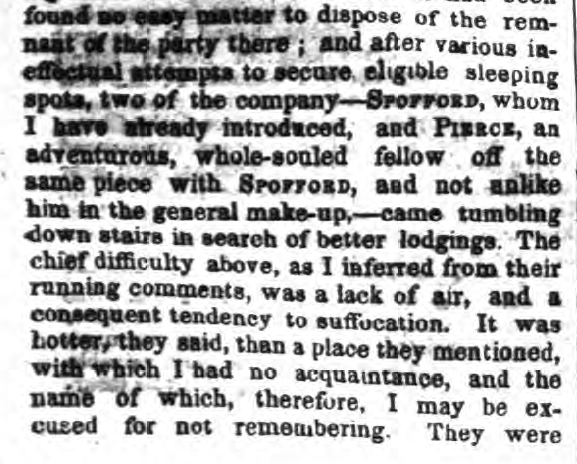 Hough and Plumley must have proposed the use of their former property for the base camp. He taught me a faultless knowledge of the woods, the name and nature of plant and herb and tree, the languages of the night, and the occultism of silent places and soundless shores…He had a most gentle and mannerly reticence and that sweetest of all habits in man or woman – the habit of silence. He could look and see, listen and hear, and say nothing… His knowledge of woodcraft was intuitive. He knew the points of the compass sensationally. He was an atom whose nature mysteriously held it in reciprocal connection with the magnetic currents of the world. In the densest woods, on the darkest nights, he was never bewildered, never at fault… He was the only guide I ever knew…that could not in any circumstance lose himself or his way. They tell me he is dead. It is a foolish fashion of speech and not true. Not until the woods are destroyed to the last tree, the mountains crumbled to their bases, the lakes and streams dried up to their beds, and the woods and wood life are forgotten, will the saying become fact. 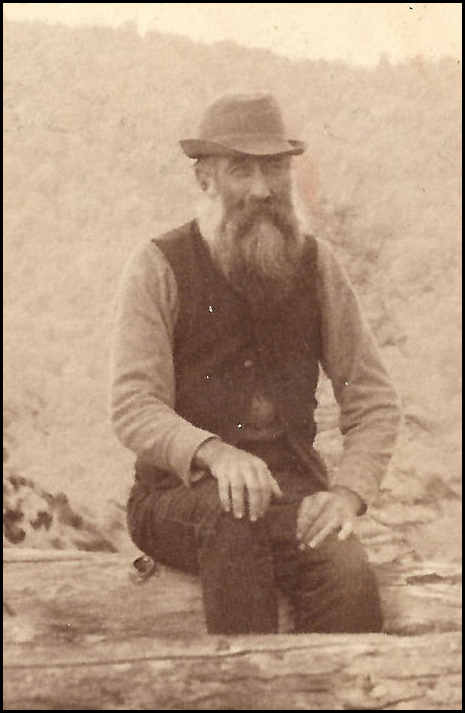 For John Plumbley [sic] was so much of the woods, the mountains and the streams that he personified them. He was a type that is deathless. Memory, affection, imagination, literature – until these die, the great guide of the woods will live with ever enlarging life as the years are added to the years, and the lovers of nature and sport multiply. And so here I do my part to breathe life into the memory of Honest John Plumley. * John’s last name appears with and without the “b” in various written histories. However, the legal deeds to his property on Indian Point spell his name without the “b” and thus I have adopted that standard. If you ever drive south along Route 28 to Indian Lake from Blue Mountain Lake, look for a sign on the right about 0.4 mile south of Potter’s Corner announcing you are crossing the divide between the St. Lawrence River and Hudson River Watersheds. The waters of Blue Mountain Lake flow through the Eckford Chain into Raquette Lake, north through Long Lake and the Raquette River eventually reaching the St. Lawrence Seaway. The waters of Durant Lake, only a half mile distant from Blue, eventually flow into the Hudson River. If Farrand Benedict had been successful with his grand visions of reshaping the Adirondacks, the waters of Blue, Raquette and Long lakes would today flow into the Hudson River Watershed. The history of the development of the central Adirondacks might also have been greatly altered. In my search for the history of our family’s cabin, I sought out all of the title deeds starting with our family’s in 1876 going back to the first title deed ever issued for this particular plot of land. I had always known from Ruth Timm’s books that the original settlers of Raquette Lake, Matthew Beach and William Wood had lived on Indian Point. However, it was only in reading the title deeds that I became aware that it was on our current property that they had settled. It was through researching the deeds that I first learned of Farrand Benedict. Although several contemporary descriptions of Matthew Beach and William Wood’s residency on the land peg their arrival to sometime between 1837 and 1840, they only obtained legal title to their lands in 1849. That is when they separately paid Farrand Benedict and David Read for titles to 25 acres each for their property. Obviously property owners having to pay for title to lands they already possessed is a pattern that history likes to repeat within Township 40. Farrand Benedict was a professor of math and engineering at the University of Vermont in Burlington. He was an accomplished surveyor and began to explore the Adirondacks in 1835. 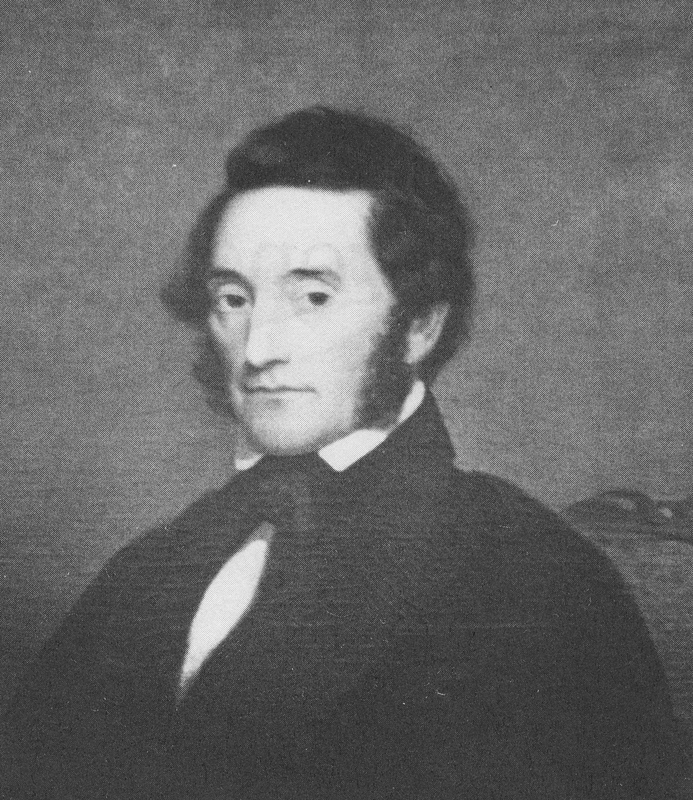 In 1838, Professor Ebenezer Emmons, the surveyor who named the region the Adirondacks, engaged Benedict to resolve a dispute over the altitude of Mt. Marcy. 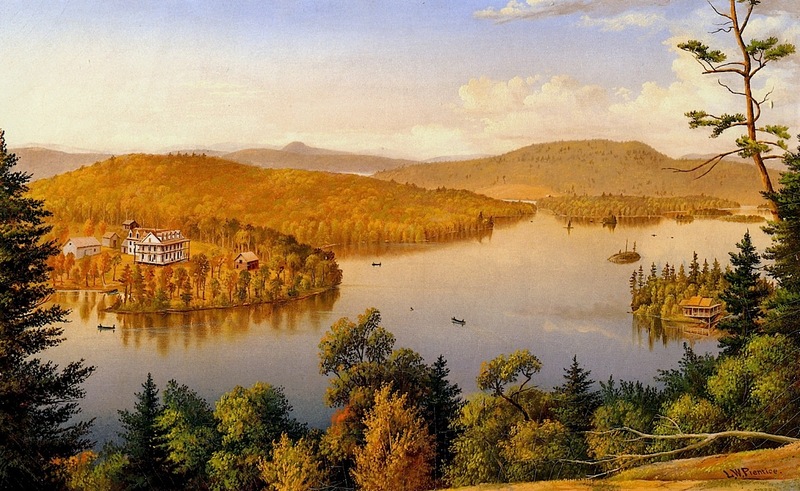 Between 1843 and 1852, Benedict purchased 152,000 acres stretching from west of the Moose River Plains to the headwaters of the Hudson River east of Long Lake. In 1848, he and his business partner David Read became sole owners of all of Township 40, which includes Raquette Lake. 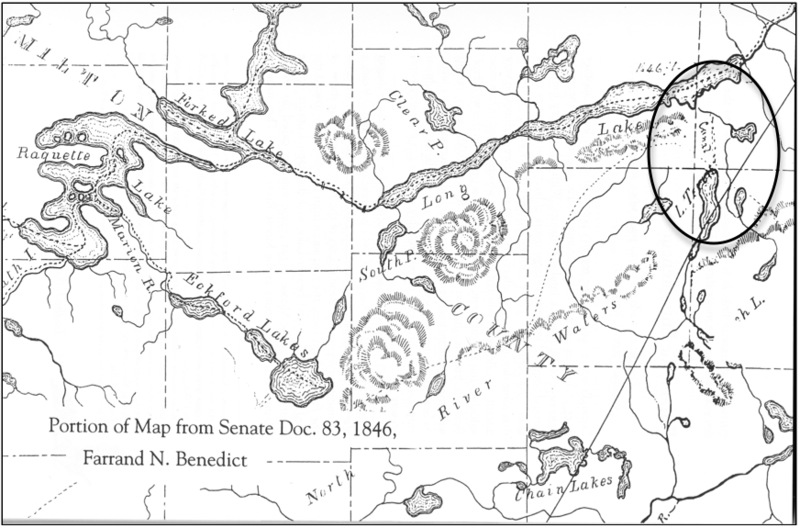 In 1846, Benedict prepared an audacious plan for the NYS Legislature to build a series of canals, with locks and slackwater navigation, and railroads which would link Lake Champlain in the east with the Black River on the western edge of the Adirondacks. A 210-mile long course using the Ausable River Valley, Saranac River, Raquette River, the Fulton Chain of Lakes, Moose River and Black River would traverse from Port Kent to Lake Ontario. 3 The trans-Adirondack water route would bring people into the region and facilitate extracting timber and mineral resources from the Adirondacks. Alas, the entire project was a dream never realized. 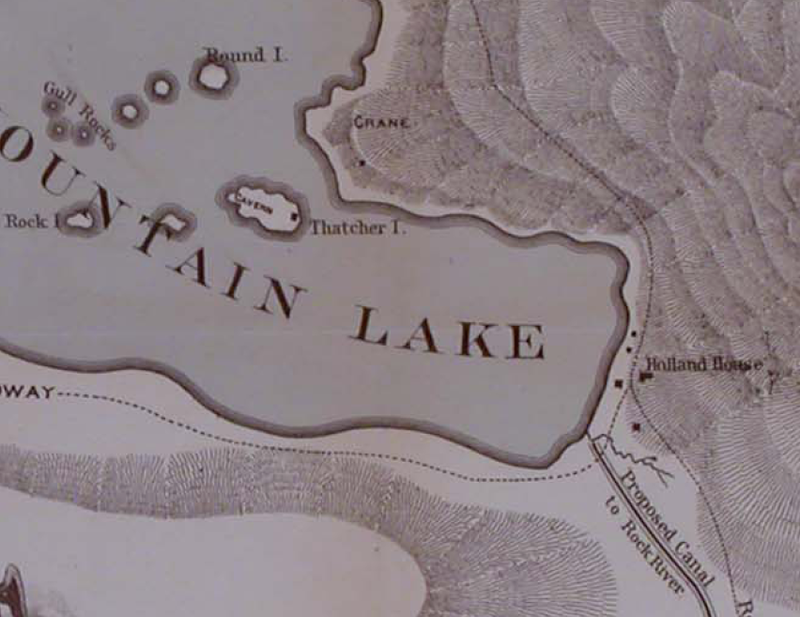 A map accompanying the original 1846 plan appears to indicate a proposed canal between Caitlin Lake (L. Terrott) and Long Lake. 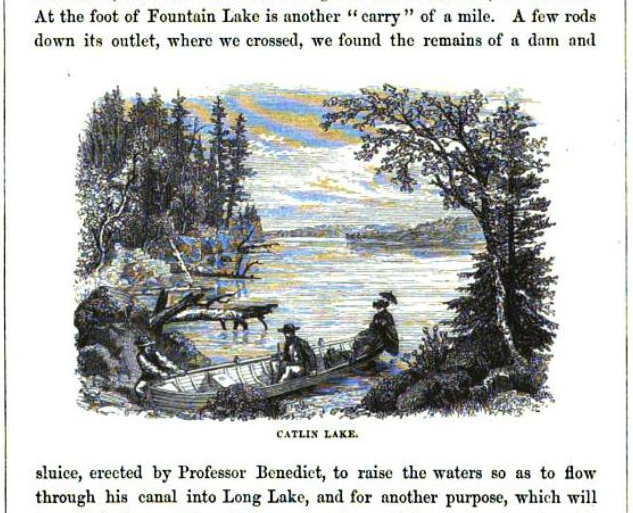 It could be that this was intended to draw water from Caitlin Lake into Long Lake to increase the water flow to aid in navigation through his trans-Adirondack water route. 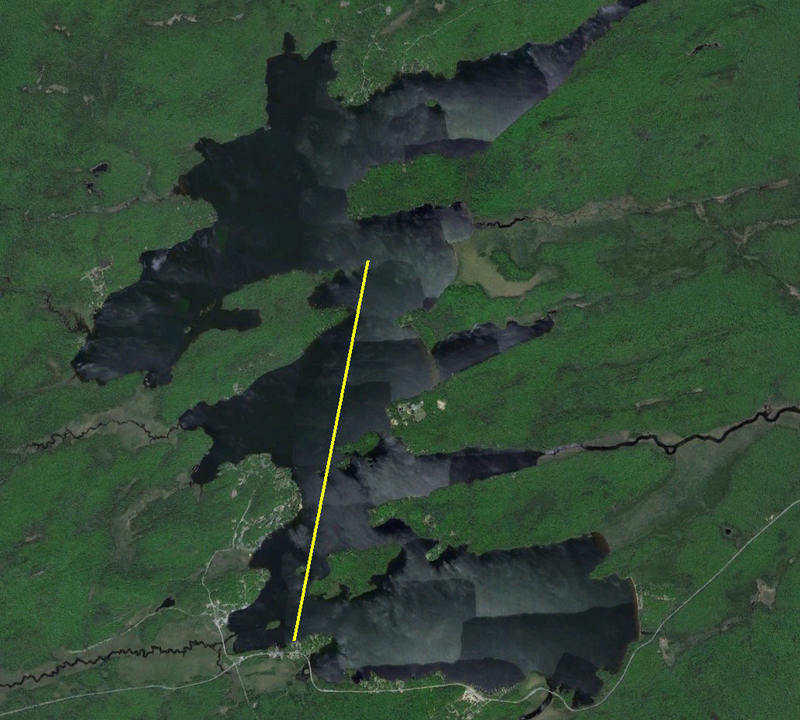 However, that would have required a dam on the natural outlet of Caitlin Lake to raise the water level and reverse the natural flow back toward Long Lake. 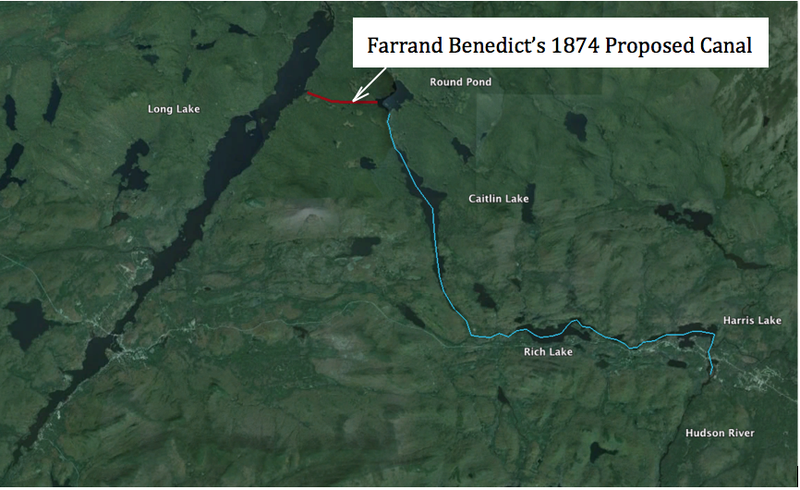 It is more likely a map error and the canal marking relates to Benedict’s intention to build a canal from Long Lake to Round Pond (the body of water to the right of the canal line). Lossing also saw the remains of a dam that would have reversed the flow of water from Round Pond (referred to as Fountain Lake) into Long Lake. 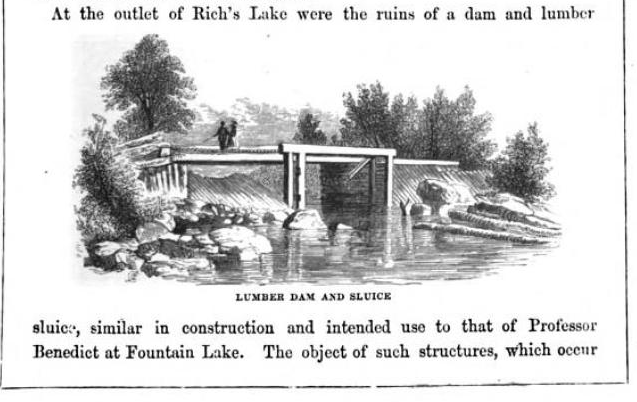 A likeness of a similar dam found by Lossing at Rich Lake is shown. The initial plans called for water to flow from Round Pond into Long Lake. This would have benefited the floating of logs down the Raquette River. 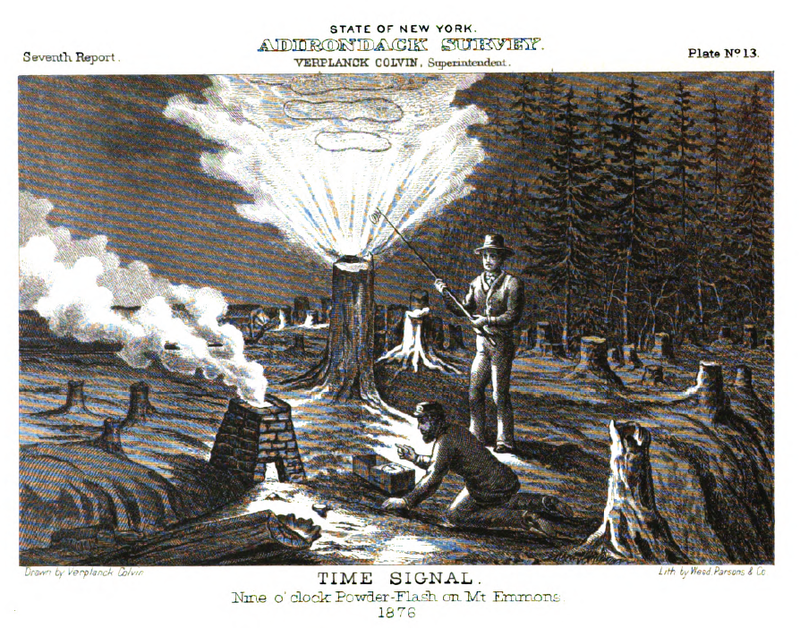 However, starting in 1850, Benedict had written of using the canal between Long Lake and Round Pond to float logs from the Eckford Chain, Raquette, and Long Lakes into the Hudson River to access the burgeoning New York timber market centered at the Big Boom in Glens Falls. 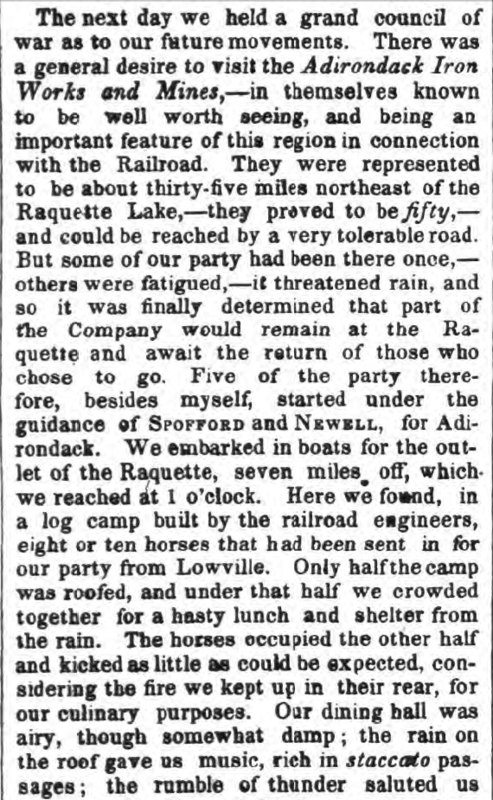 Lossing, Alfred Donaldson in a History of the Adirondacks, and John Todd in Long Lake each make the argument that opposition from lumber industry interests along the northern reaches of the Raquette River, who feared losing their supply of timber for the Canadian market, scuttled the plans for this first canal attempt. 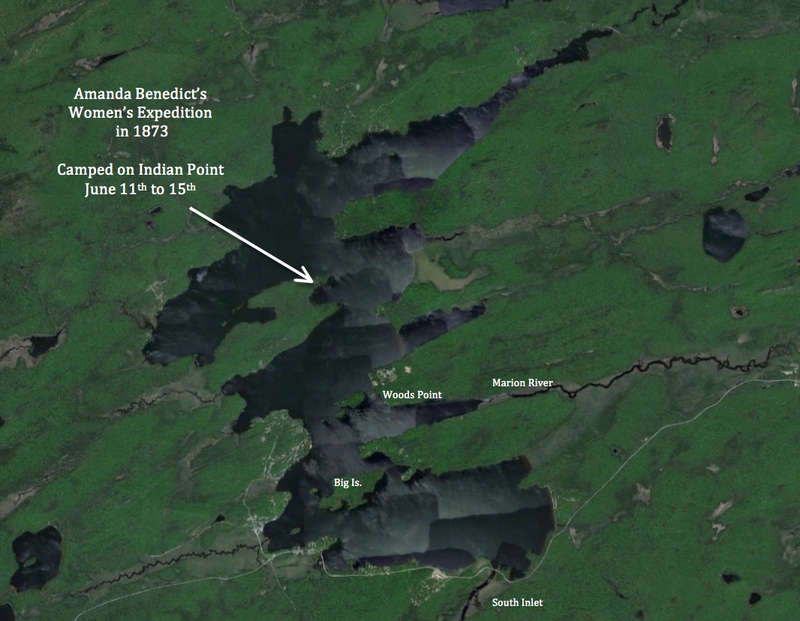 In 1874, at the age of 71, Benedict returned to his idea to build the Long Lake to Round Pond canal. The goal now was to re-route the flow of water from Blue Mountain Lake, Raquette Lake and Long Lake into the Hudson River Watershed via Round Pond-Caitlin Lake-Rich Lake-Harris Lake. It appears that Benedict no longer intended for the logging industry to float timber along his route into the Hudson. His goal was to significantly increase the supply of water into the Hudson River Watershed. Dams on the outlets of Blue Mt., Raquette, Forked, Brandreth, and Little Tupper lakes would provide controlled outflows to increase the water flow into the Raquette River and Long Lake. The canal would then divert the water to sustain log drives throughout the summer on the Hudson River. According to Finch, Pruyn and Co. records, low water levels sometimes required three years of Spring flows to transport logs from the Adirondack interior to the Big Boom at Glens Falls. Benedict’s plan would have reduced this to one year and assured sufficient summertime water flow to power mills along the Hudson as far south as Troy. Diverting the water flow out of Long Lake away from the north running Raquette River almost certainly would have endangered the effectiveness of the Raquette River for floating logs north to the Canadian market. While it appears a political scandal in the administration of the New York Governor in 1875 was the practical cause for the death of this project, had it come to fruition, it could have significantly altered the history of this region of the Adirondacks. Chapter 264 of the Laws of 1850 in New York State declared the Raquette River a public highway for the purpose of floating logs and lumber from the foot of Raquette Lake to its mouth in Massena. 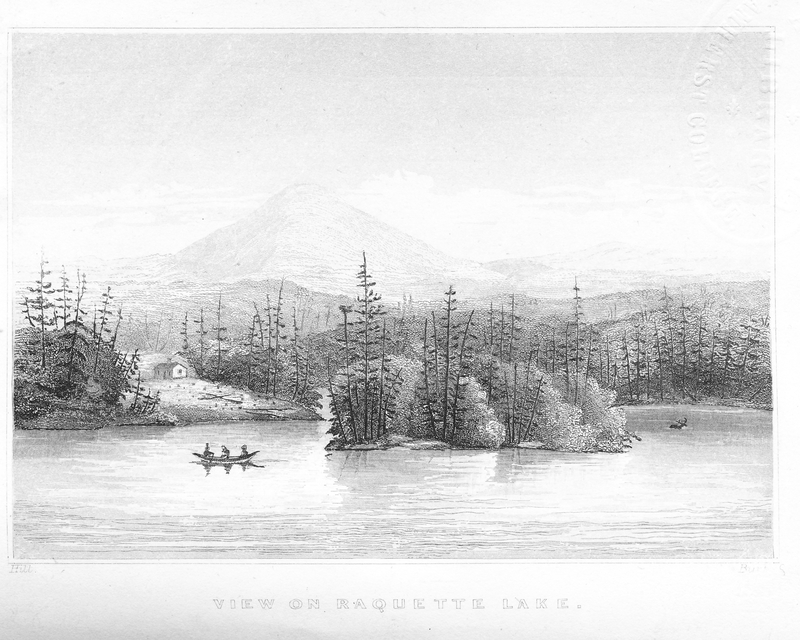 In the 1850s, Raquette Pond (not to be confused with Raquette Lake) became the home of the Pomeroy Lumber Company. 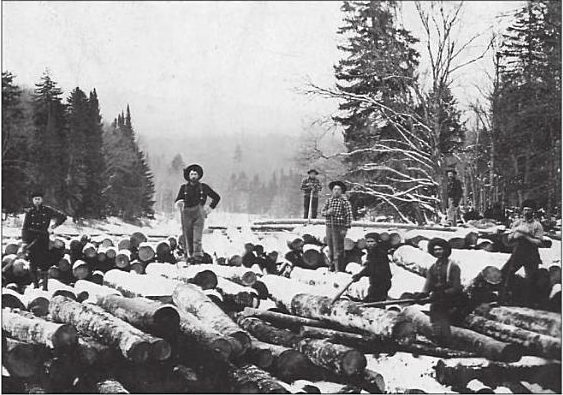 Loggers would float logs down the Raquette River to Raquette Pond where they would be marked, sorted and prepared for large log drives down the Raquette River to the mills in the northwest corner of New York and the Canadian timber market. The logging camps on Raquette Pond grew into the Town of Tupper Lake. 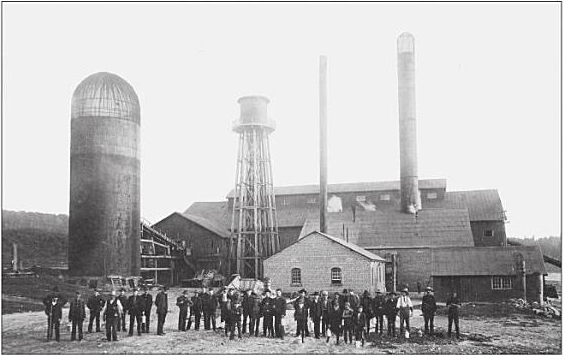 The logging industry and the town expanded greatly in 1890 with John Hurd’s construction of the largest lumber mill ever built in New York and his completion of his Northern Adirondack Railroad that connected Tupper Lake to Ottawa, Canada. 6 Although the milled lumber now moved north on trains, the mill still was dependent on logs floated down the Raquette River to Raquette Pond. It is doubtful that Tupper Lake would have become the largest population center in this part of the Adirondacks had the water flow been diverted from the Raquette River by Farrand Benedict’s Canal. John Hurd’s Big Mill. From the Goff Nelson Library Collection. Published by Jon Kopp in Tupper Lake: Images of America. 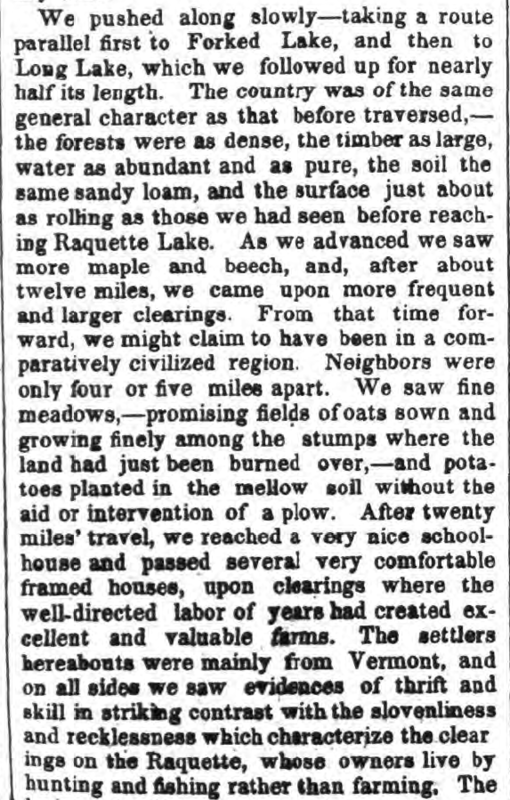 Fortunately for Tupper Lake, Benedict’s land empire began to evaporate with sales of large tracts to the railroad companies in 1855. 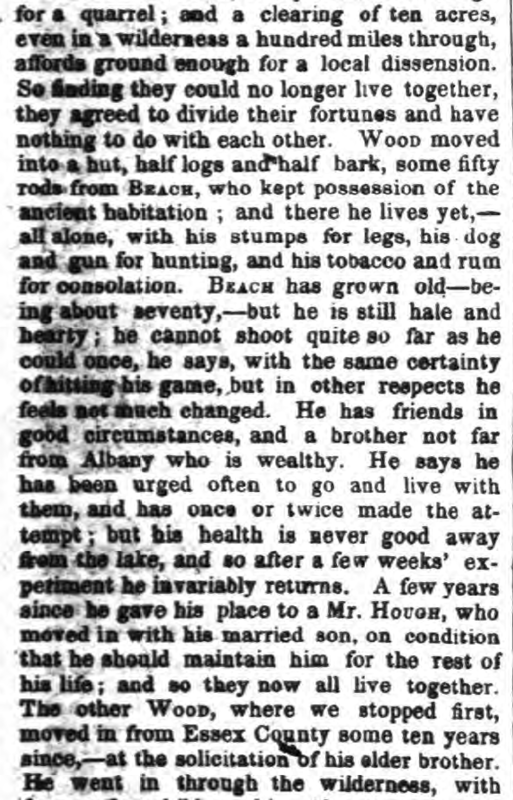 By the time of his death in 1880, his family’s lands had all been sold or reclaimed by the State for back taxes. His grand plans were simply forgotten. This chapter is based on the extensive research of Barbara McMartin in her book To the Lake of the Skies: The Benedicts in the Adirondacks. 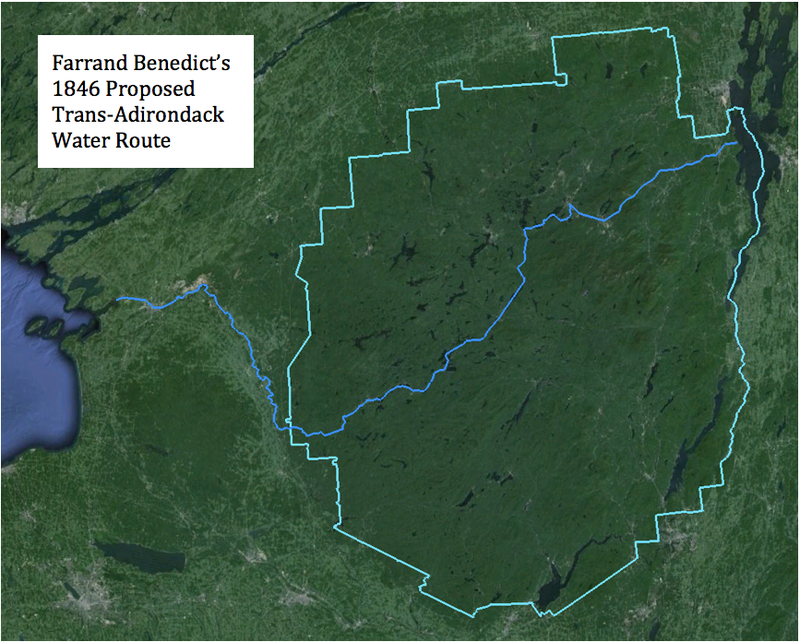 McMartin argues that despite the failure of his ventures, Benedict did have one lasting impact on the Adirondacks. He first introduced the Reverend John Todd and his cousin Joel Tyler Headley to the Adirondacks. 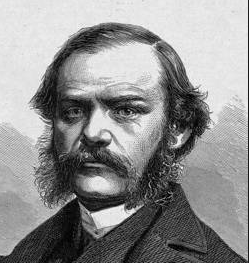 Todd and Headley authored Long Lake in 1845 and The Adirondack: or Life in the Woods in 1849, respectively. 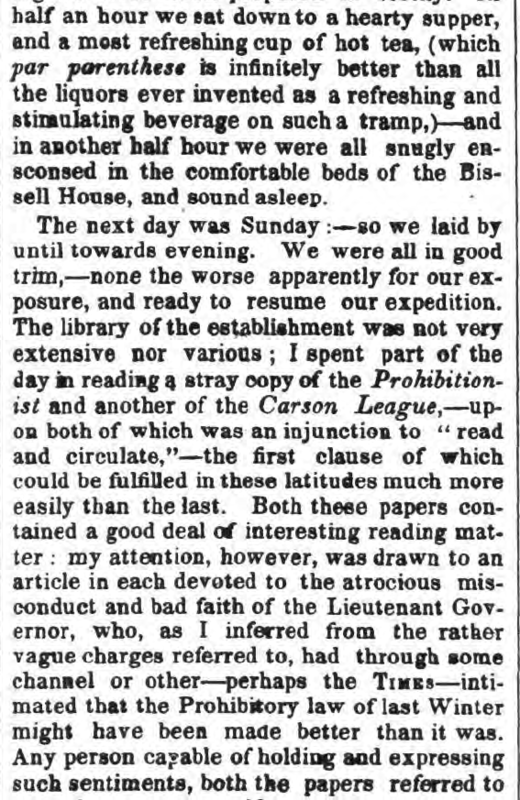 These early writings attracted other adventurers and laid the path followed by the great Adirondack promoter Reverend William H. Murray. The History of Hamilton County. Ted Aber & Stella King. 1965. page 793. The mysterious original cabin of the Thachers on Indian Point received numerous mentions in the newspapers of the day. However, the earliest evidence of its existence comes from the single sentence in the text above. It refers to Rev. Henry Gabriels who at the time was President of the St. Joseph Seminary in Troy, NY and who later became the Bishop of the Diocese of Ogdensburg, which encompasses all of the Adirondacks. 1 Can we simply assume that the original cabin was built in 1878, or might it have existed prior to this first reference? After all, the family purchased the land in 1876. Two pieces of history steer me to conclude that 1878 does indeed mark the construction of the original cabin. Starting in 1867, the G.W. and C. B. Colton & Co. publishing company produced a series titled Map of The New York Wilderness and The Adirondacks, compiled by the cartographer W.W. Ely. The original map was updated almost annually from 1867 to 1890. If one assumes that every updated map reflects changes that were first observed through surveys in the year prior to publication, these maps provide a vivid, visual historical timeline. I was amazed to discover in the fine details that in the version of the map published in 1879, the name Thatcher appears written across the whole of Indian Point. The name appears on all subsequent map editions but on none prior to 1879. But if the original cabin was built in 1878, the question remains why, with a beautiful lodge on Thacher Island on Blue Mountain Lake, did George Hornell Thacher choose to move further west and establish a new outpost on the shores of Indian Point on Raquette Lake? An understanding of the changes occurring at Blue Mountain Lake at the time provides a clue. 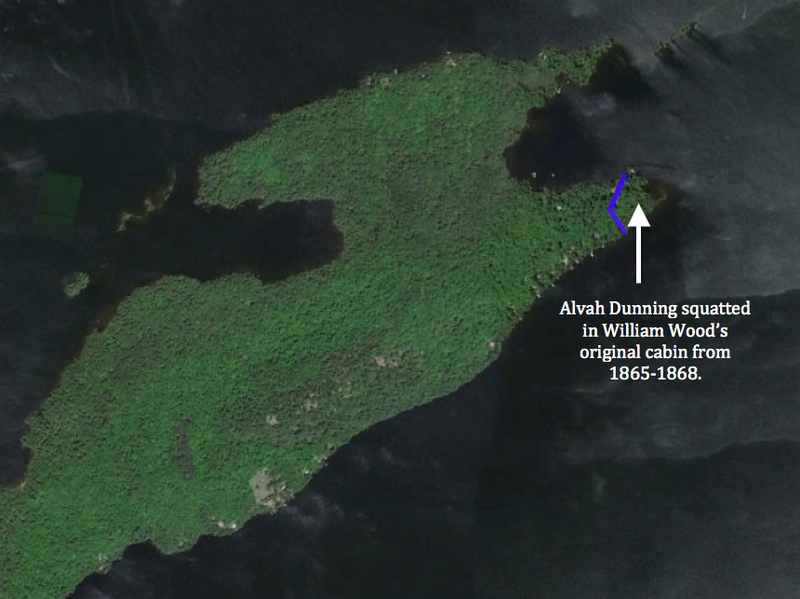 GHT first came to the Adirondacks in 1862 and established his summer home on Thacher Island in 1867. 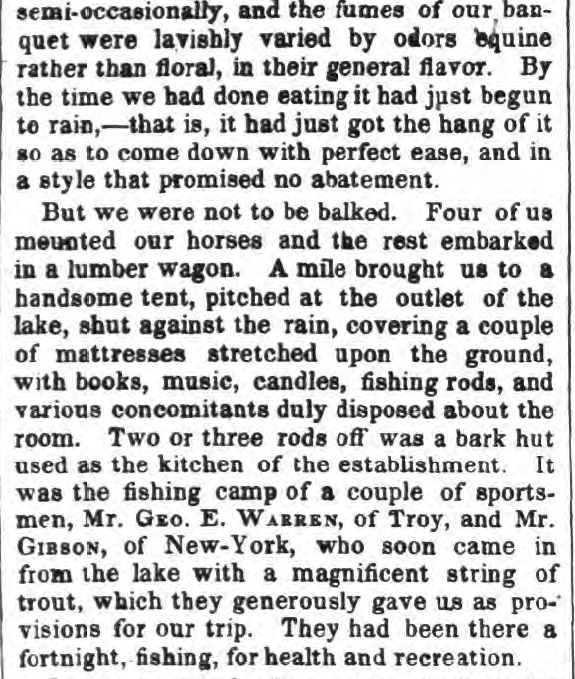 This was a time when travel to the Adirondacks was an adventurous expedition for wealthy “sports” and their guides. In the early years at Blue Mountain Lake, GHT’s peace and serenity among the pines would have only been disturbed by small groups of hunting and fishing parties frequenting the camps established by Chauncey Hathorne at Potter’s Landing and Mitchell Sabattis on Crane Point. Things began to change in 1874 when Tyler M. Merwin built the first of several cottages above the lake on the hillside where the Adirondack Museum stands today. 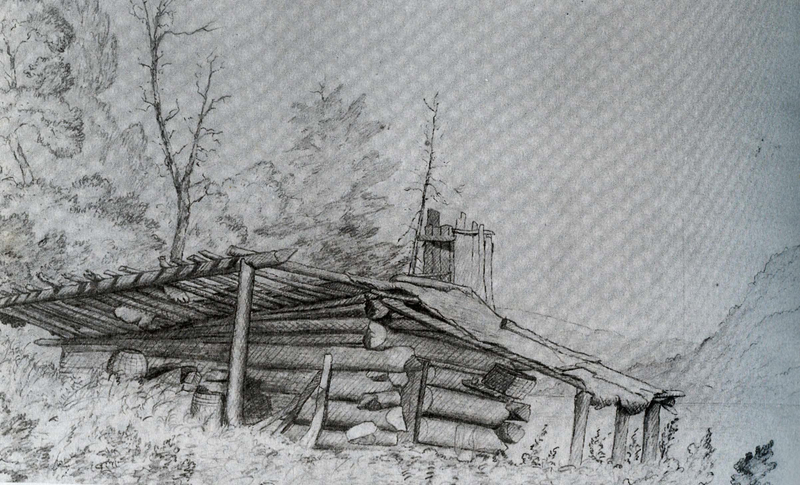 Merwin’s original Blue Mountain House – courtesy of the St. Hubert’s Isle website. The Blue Mountain House originally only accommodated between twelve and twenty people, but by 1880 additional buildings increased this number to 100. 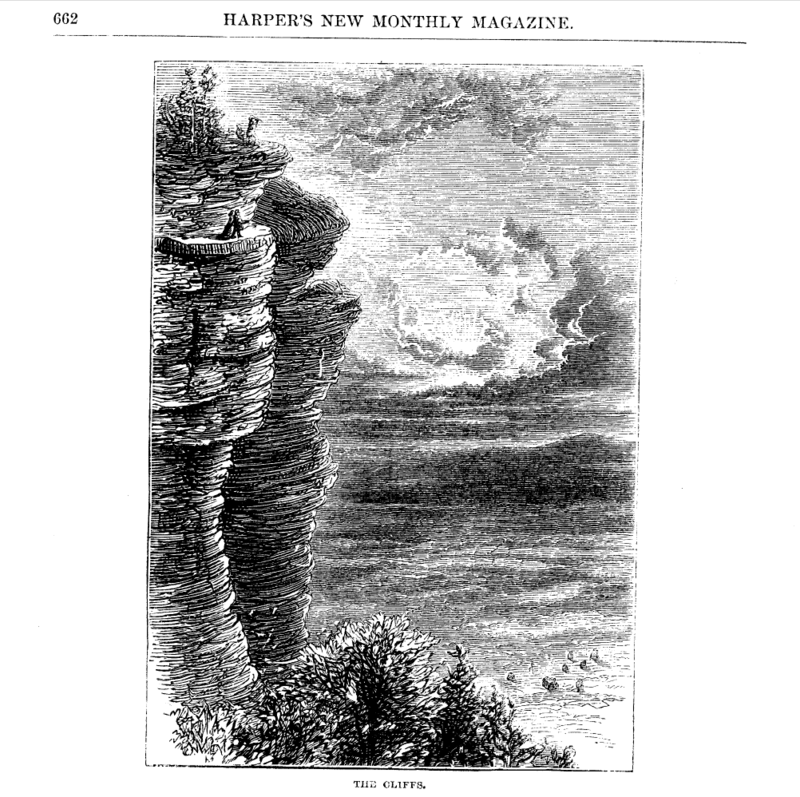 Merwin’s expansion of the Blue Mountain House – courtesy of the St. Hubert’s Isle website. In 1875 John G. Holland built the first proper hotel, the Blue Mountain Lake House. A primitive log structure of two and a half floors, it accommodated up to 60 guests. Within six months of the hotel opening, the Thachers purchased the land on Raquette Lake. In 1878 an addition to the hotel allowed for a total of 200 guests. In the same year, James Ordway built the Ordway House to house thirty guests, seen here in a painting by Levi Wells Prentice. The structure on the island at the right of the painting is our family’s lodge on Thacher Island. Painting by Levi Wells Prentice – Courtesy of the Adirondack Museum Collection. Prospect House – 1889 photo by Seneca Ray Stoddard – Library of Congress Collection – Courtesy of St. Hubert’s Isle website. Recreation magazine. 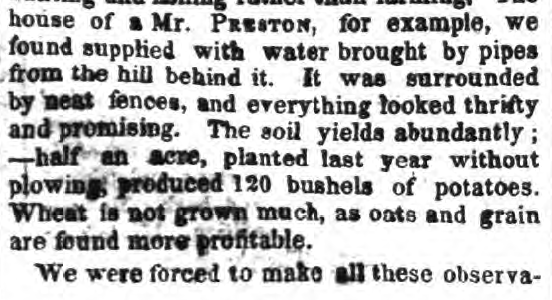 July 1896. page 191. 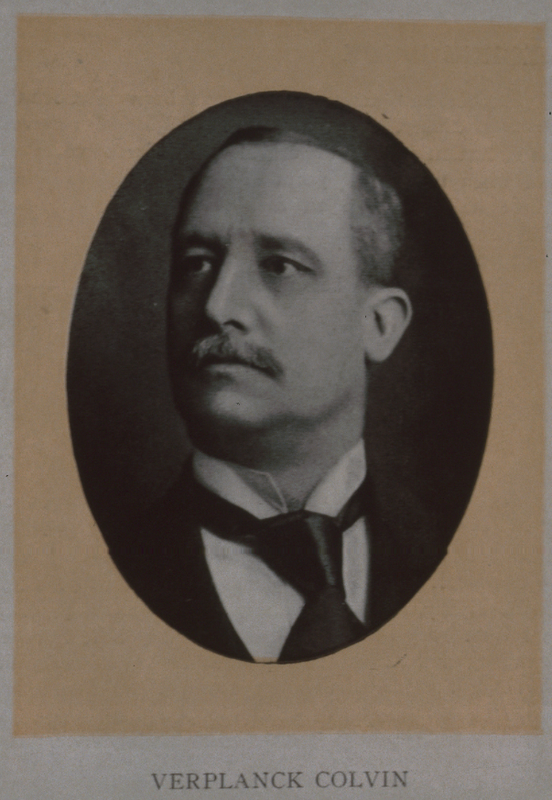 G. O. Shields, publisher. NY. NY. New York Times. July 31, 1881. 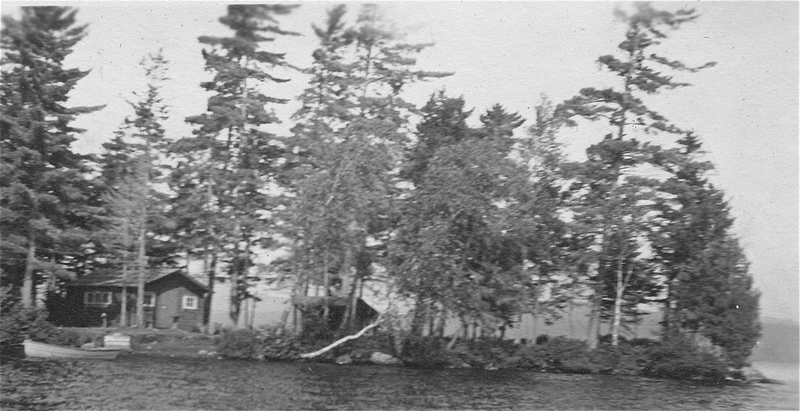 GHT’s antagonism toward the modern steamboats plying the waters of Raquette Lake was not unique. Their impact on the livelihoods of the Adirondack guides, whose guide boats were previously the only source of transportation, was a contentious issue of the day. One fateful night in 1885, a few guides took it upon themselves to scuttle and sink Buttercup, the first steamboat on Long Lake. Simultaneously, co-conspiritors dynamited the outlet dam which kept the water deep enough for steamboat navigation of the lake. 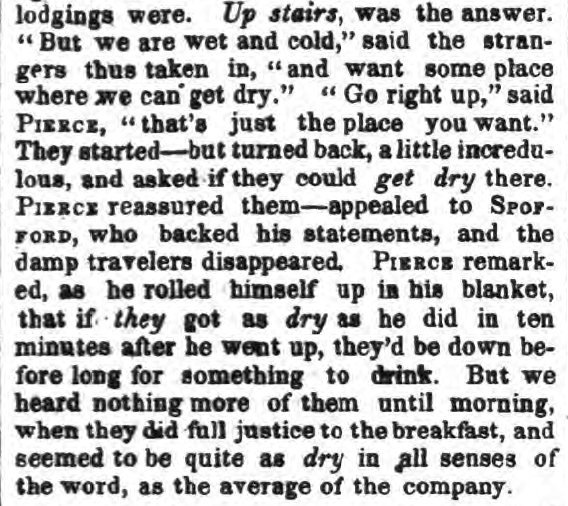 The culprits were never brought to justice as related in these excerpts from an article in the Brooklyn Daily Eagle. This steamboat replica is similar in size and appearance to the original Buttercup. Brooklyn Daily Eagle. 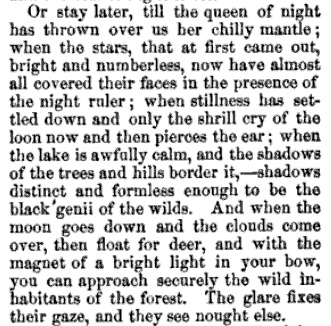 August 16, 1885. page 12. 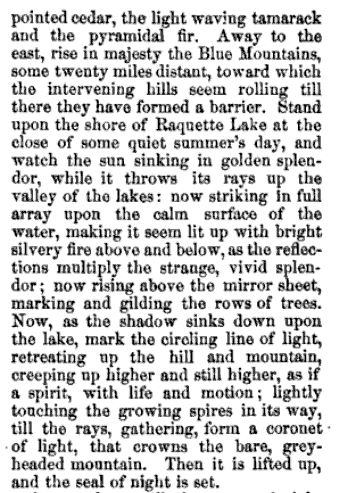 So in 1876, as Blue Mountain Lake began a building boom, George Hornell Thacher looked to Raquette Lake in search of a quiet, isolated place more in keeping with the rugged character of the Adirondack guides whom he held in high esteem. 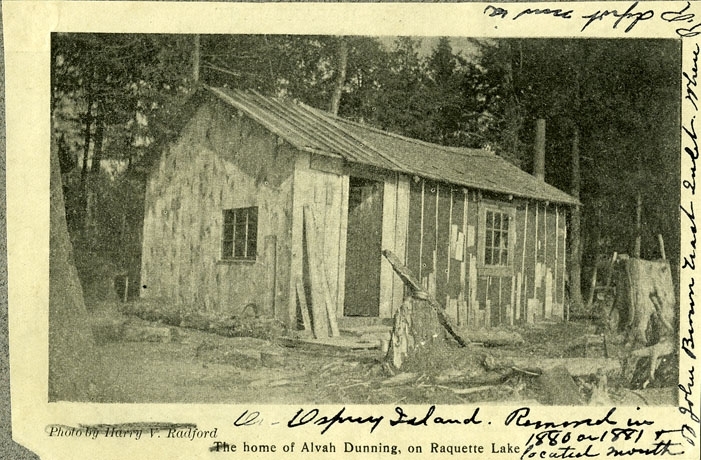 Why did he choose Indian Point upon which to build his “camp” and where on Indian Point was this “fine lodge”, “fine residence”, “cottage” built in 1878? The mystery will continue to unravel in these pages. While this book hopes to expand beyond simple stories of my family, it is through our history that I became aware of the heritage of Indian Point both before and during our tenancy. To be clear, “our” tenancy speaks not solely of those named Thacher. My father’s sister Ellen married Michael FitzPatrick. Both families enjoyed summers together sharing the cabin and two lean-tos until 1981 when our family built a new place on the north shore of the peninsula. Each summer, a growing brood of FitzPatrick cousins continues to inhabit the little, red one-room cabin at the point’s tip. My journey began with a desire to learn when this cabin was built. As a child I would fall asleep in the lean-to that sits just to the right of this cabin, being driven to sleep by the flames dancing in the stone fireplace and the hypnotic pulsing of the green and red lights which adorned the channel buoys in the Needles. 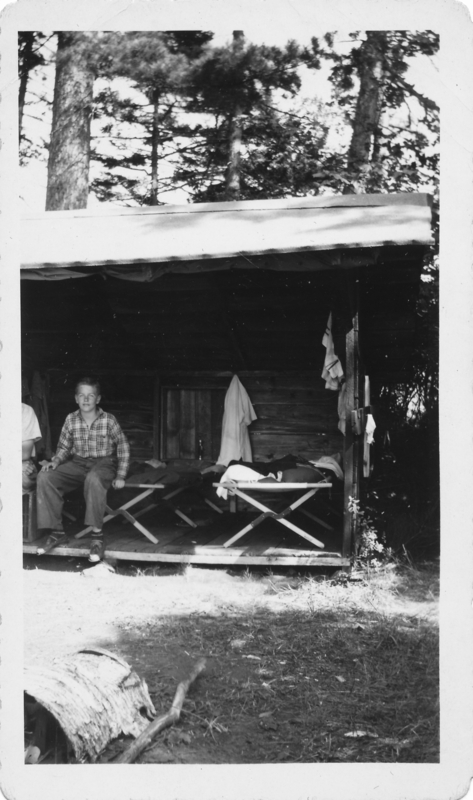 My father is shown here as a boy in the same lean-to. Kenelm R. Thacher Jr. in 1945. By the fire, my father and aunt would tell stories of their times here and on Blue Mountain Lake. Originally, the main family summer home was on Thacher Island on Blue Mountain Lake. 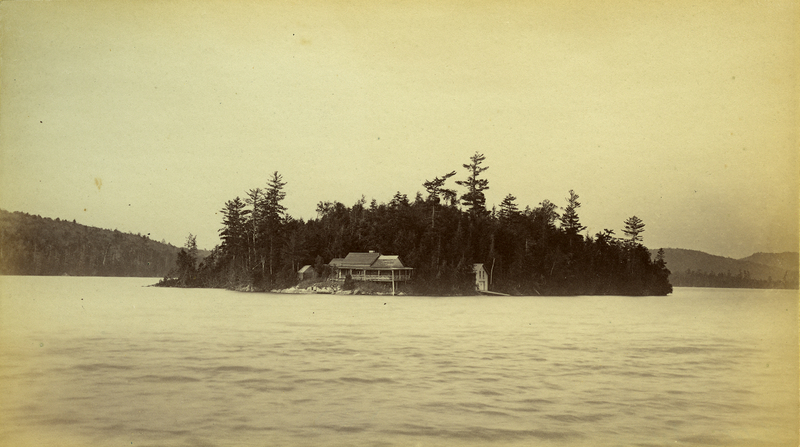 The island lodge was the first and only privately owned summer home on the lake for a decade beginning in 1867. 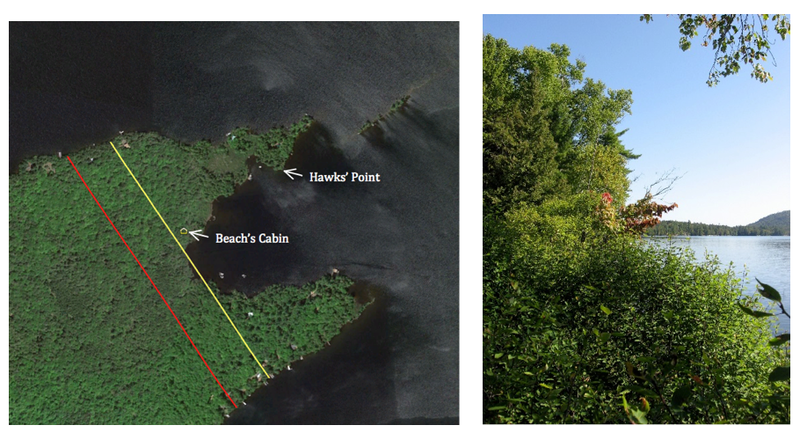 The island was purchased by John Boyd Thacher, who built a lodge for the use of his father, George Hornell Thacher. Photo by Seneca Ray Stoddard 1880’s Courtesy of the Adirondack Museum. The island lodge remained in the family until the 1940s while the lands on Indian Point, purchased in 1876, were always referred to as the “hunting and fishing” grounds. We have always considered ourselves extremely lucky to still possess these wonderful acres on Indian Point. Yet we wonder what transpired here between 1876 and now. The oral history speaks of John Boyd Thacher and his brother George Hornell Thacher Jr. using Indian Point for guided camping adventures, with their father remaining at the island in Blue Mountain Lake. 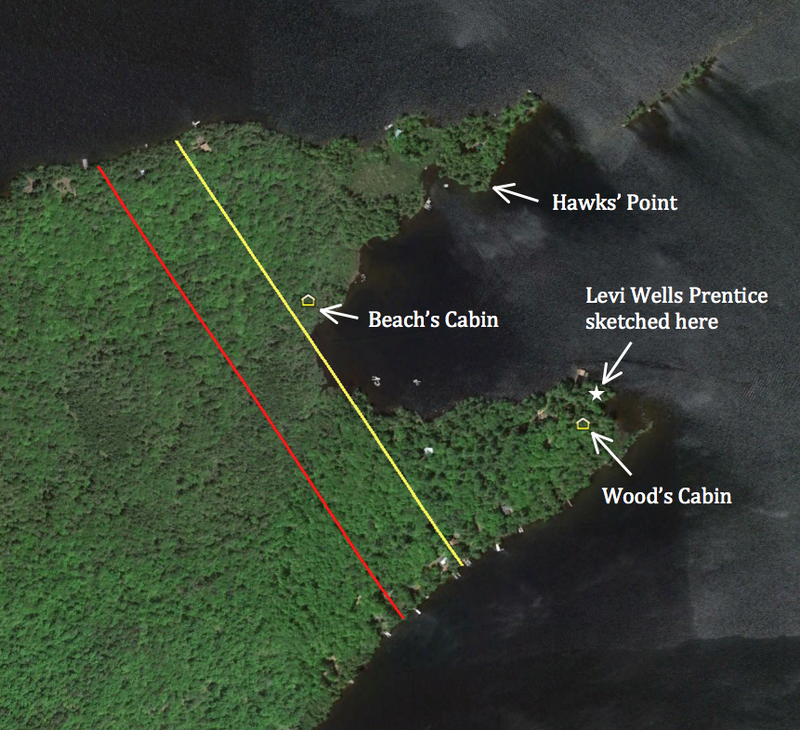 Family lore holds that the red cabin was the first thing to be built on the point. We have vague memories of our parents claiming that the cabin dates to 1910. My challenge is to prove them right. 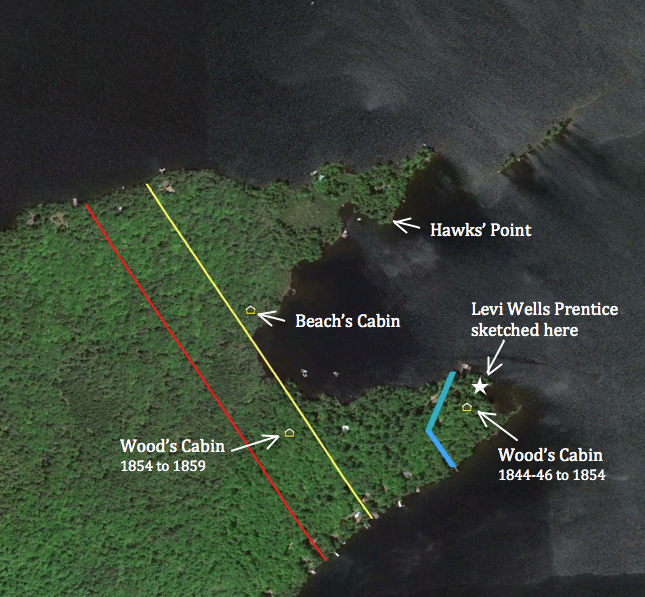 A review of several historic maps of Raquette Lake show no indication of a cabin at the point between 1886 and 1903. 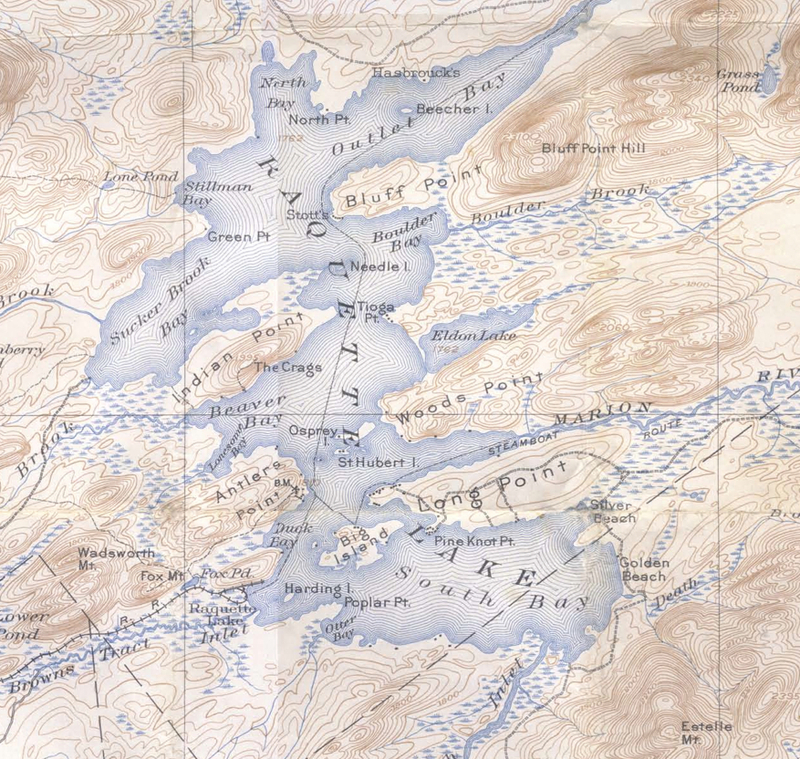 Survey Map Raquette Lake in 1886 shows the Thacher property in gray but no structure on the point. 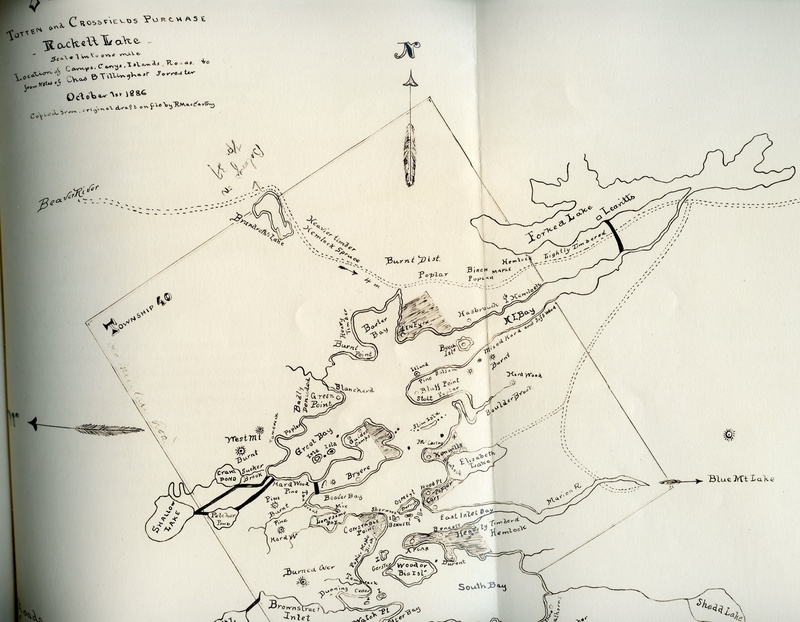 1890 Map of Raquette Lake by Seneca Ray Stoddard makes no mention of Thacher at Raquette but identifies Thacher Island on Blue Mt. Lake. 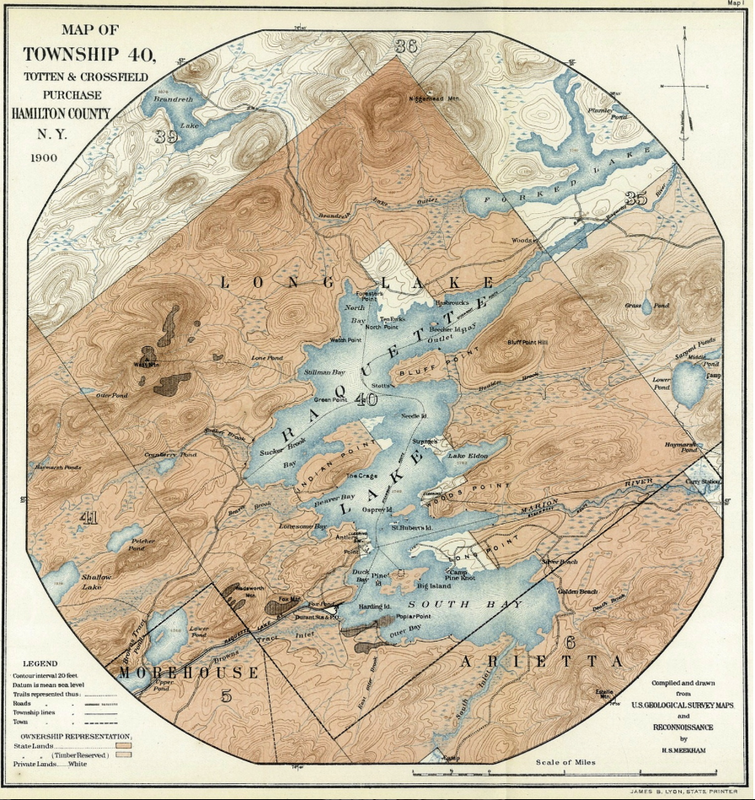 Map of Township 40 in 1900 shows the Thacher property line traversing Indian Point, but no cabin. 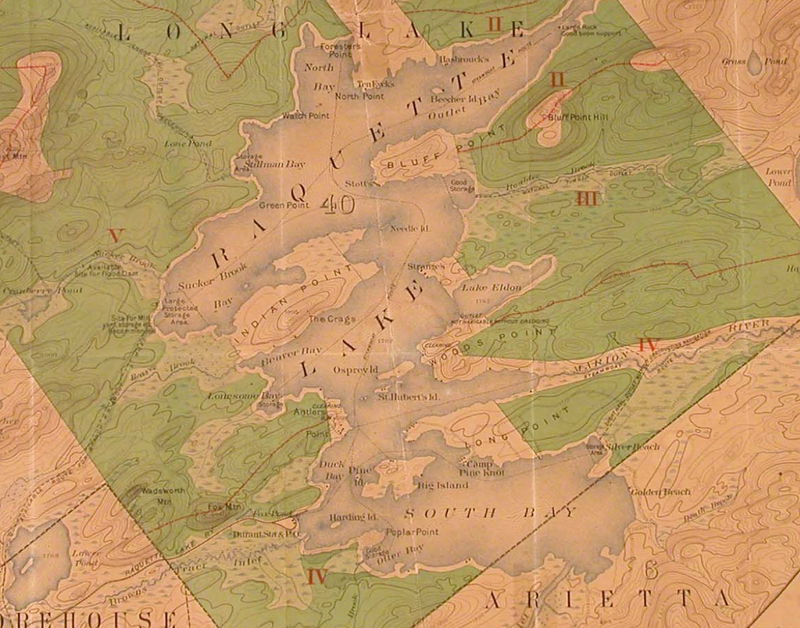 1903 USGS Raquette Lake Quadrangle shows numerous lakeshore structures but nothing on the point. 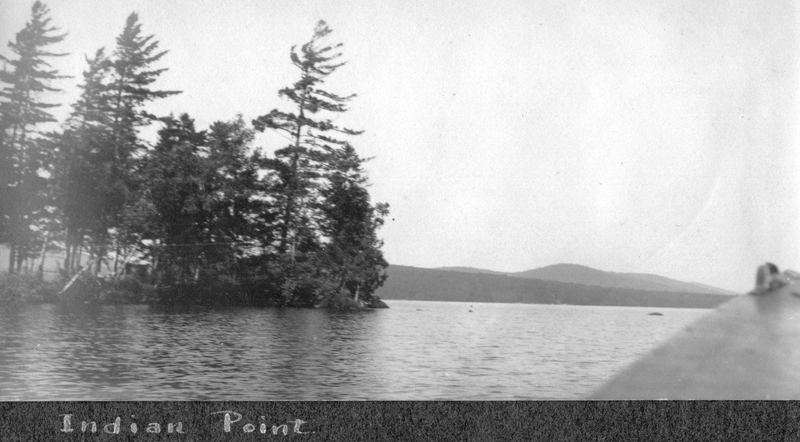 A 1905 photo from the family of Donna Phinney Geisdorf (owners of Sunny Cliff Camp deep in Sucker Brook Bay) shows Birch Point. It shows no cabin and no dock. 1905 photo of Birch Point. Courtesy of the Geisdorf Family. It is unclear if the photo shows any structure, but when blown up larger, there is an image that might be a primitive, makeshift lean-to. It has oddly straight edges and corners that would seem unlikely to be natural trees. I have highlighted the lines in red. 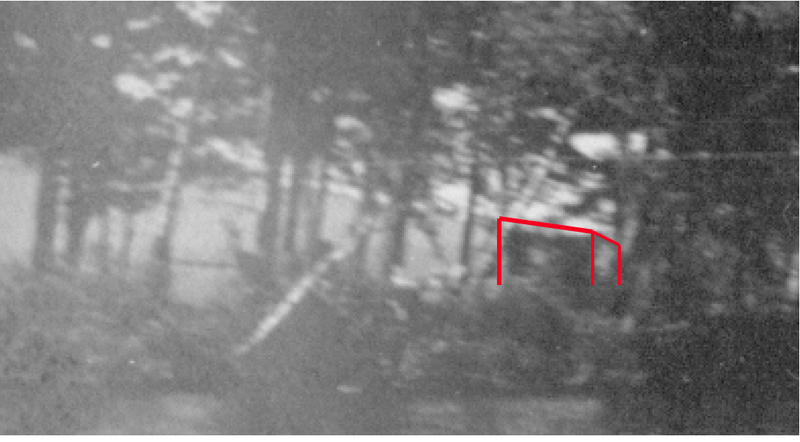 Possible evidence of a lean-to at the Point in 1905. 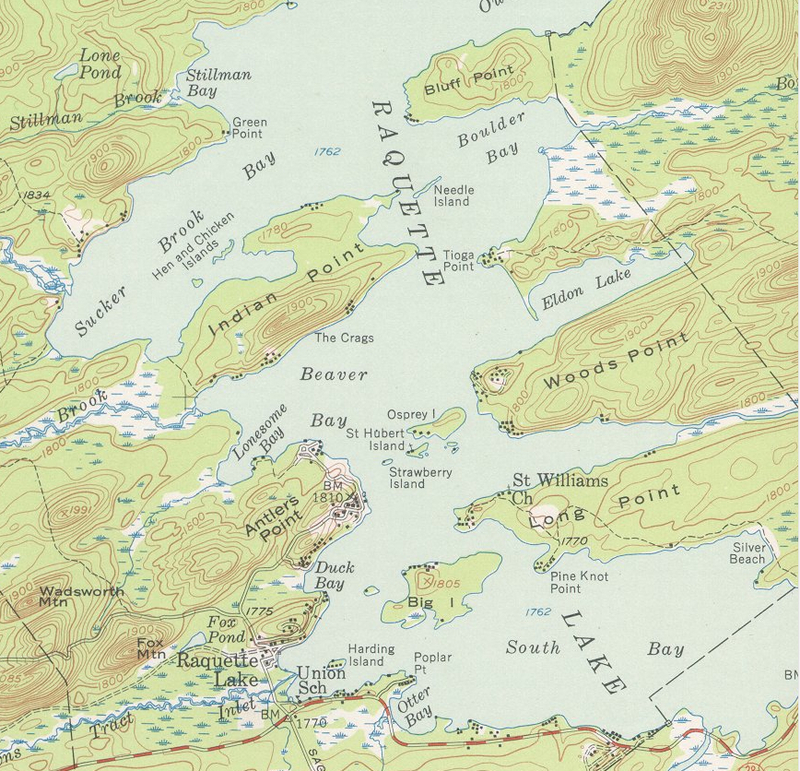 The only map that I have found to date which does indicate a structure in the location of the little red cabin is the 1954 USGS Raquette Lake Quadrangle. Unfortunately, there appear to be no USGS surveys done between 1903 and 1954. So the cabin was built sometime after 1905 and before 1954. Couldn’t we narrow it down a little better than that? Perhaps it was time to talk with the locals of Raquette Lake to see what they knew of the cabin’s history. Fortunately, there is one person with direct personal knowledge of the cabin. Warren Reynolds was born and raised at Raquette Lake. His family rented the little red cabin for the summer of 1938 and then lived there for a whole year beginning in the summer of 1939. He shared stories with me of his family living through the winter of ’39-’40 in the small one room cabin. Warren travelled to school by boat when the water was open and by dogsled over the ice in winter. His father worked as a guide in season and hunted, fished and trapped for his family’s sustenance. The family could not have survived if his father had obeyed the Game Warden’s regulations. To hide his illicit bounty of fish and venison taken out of season, Warren’s father dug a 6′ by 4′ hole six feet deep and set 350 feet back in the woods to the west of the cabin with a wooden cover camouflaged with pine pitch, sticks and leaves. The remains of this “ice box” are still there today. 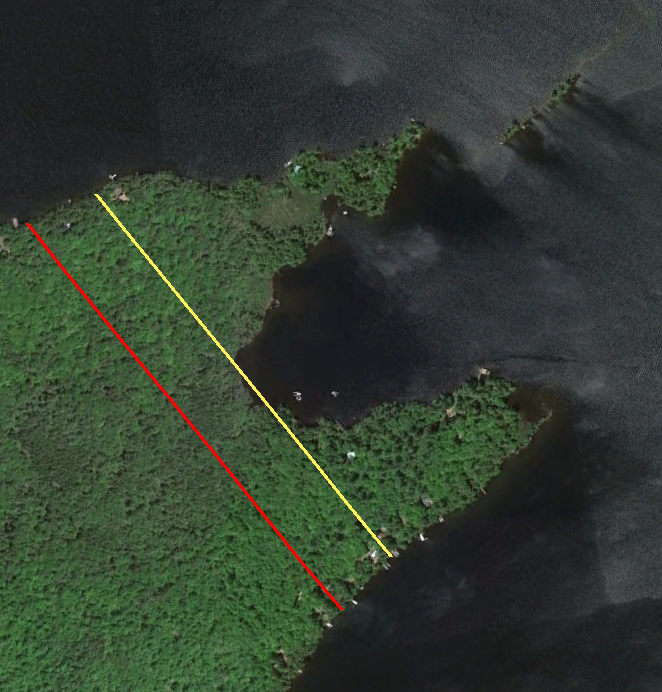 I next approached the local Raquette Lake historian, Jim Kammer, to see what he might know of the cabin. He produced a photo that is part of a collection from the Carlin Boat Livery, one of the first marinas on the lake, located near the present day dock of the Raquette Lake Navigation Co.’s W. W. Durant. The Carlin Boat Livery was in operation from 1900 to 1935 and dates the photo of the cabin to within those years. 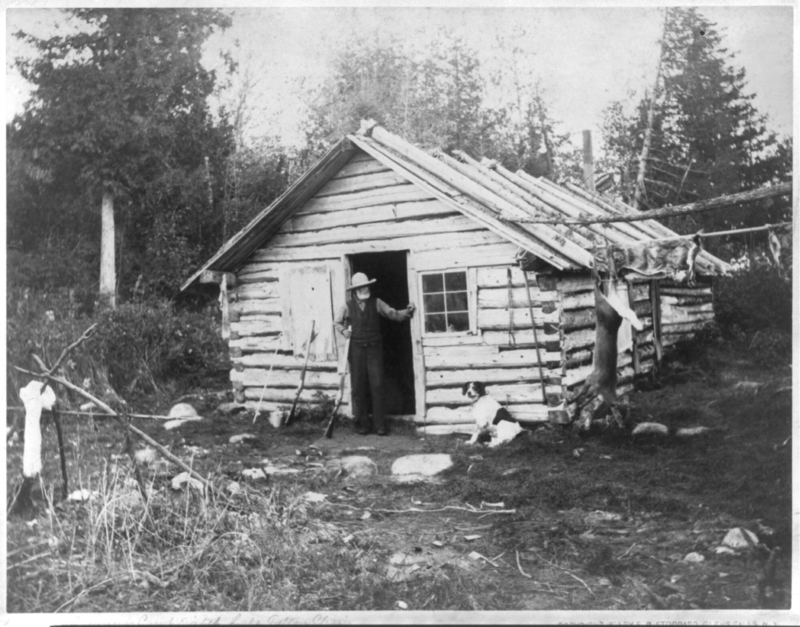 Earliest photo of the little red cabin. Courtesy of Jim Kammer. We know from the previous photos that this has to be after 1905. When I showed Warren Reynolds this photo, he remarked that the boat appears to be a row boat without motor moored off shore with no dock visible. In 1938 there was a dock and the Thacher’s gave Warren’s family use of a boat with a small outboard engine. The photo is also missing a tool shed that Warren remembered being between the little red cabin and the lean-to. Lastly, Warren commented that the cabin was far from brand new when his family lived there. He thought it was about twenty years old at the time, which would date it to 1918. Given all that we know – the local lore, photographic and map evidence – we can say that the little red cabin was built sometime between 1905 and 1918. While this does not contradict the family oral history, I strive to narrow the window in time. Perhaps through reviewing historical newspapers and contemporary literature, I might glimpse proof of this alleged 1910 date….